People always ask us what we do with all the small, leftover “scrap” pieces once we produce a design. Well… the answer is that we save them in hopes of finding something cool and creative to do with them. After all, we’re repurposing and recycling a piece of history, so we don’t want to toss out even the smallest of pieces, no matter how insignificant they may seem to some. When we introduced our first Desk Lamp design back in 2000, it had a limited edition run of 92. It was so popular, it sold out in about a year and the design was retired. Since then, we still get inquiries from customers about the Desk Lamp, hoping that one has become available over the years. Now that Richard has a chance to think about new product designs, he thought that it would be an ideal time to come up with a design for a new lamp. However, he wanted to do something creative with those steel pieces that he always has left over from the production of existing designs. 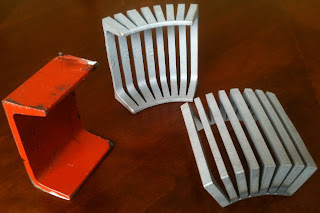 One of the most common pieces that he ends up with is the one pictured above on the left, but there is nothing really exciting about it in terms of its shape or size, and since it is such a small section of steel, it doesn’t always have much weathering on it. Then it occurred to him, what if he was able to slice it up and fan it out into some type of shade for a lamp? The result of this experiment is the fanned out sections of steel shown on the right in the photo above. Richard still has to play with the design a little more, determine how and what to mount the shade to, and how the light will shine through, but he’s very excited to see what the next step in the prototyping process will bring. He hopes to have the design ready to go in time for the holiday season. Stay tuned for the announcement of the launch for this new design. It may sell out quickly, so let us know if you want to be put on the waiting list to order one! It has been a busy summer for Golden Gate Bridge Furniture Co. Although the company has been around since 1994, it has had a flurry of activity in recent months. Richard Bulan, the founder of GGBFC, crafts limited edition, artisan furniture from repurposed steel off San Francisco’s Golden Gate Bridge. Specifically, his designs are crafted from sections of pedestrian handrail, originally placed on the bridge during its construction in the 1930’s, and removed during the bridge’s handrail replacement in 1993. This summer, GGBFC has launched a new Coffee Table design, as well as a newly redesigned website. In addition, Richard Bulan has finally realized the dream of having his own space to showcase his designs by setting up a Coastside showroom. Located on the ground floor of the Clock Tower Buliding at Rockaway Beach in Pacifica, the showroom provides an inventory and order fulfillment space as well as a place to display finished product. Richard invites you to come check out the designs at www.ggbfurniture.com or to make an appointment to come see the showroom in Rockaway Beach, Pacifica.